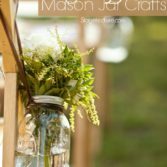 When it comes to finding a DIY room decor project that has practical use as well as a decorative character, mason jars are definitely great items to use. 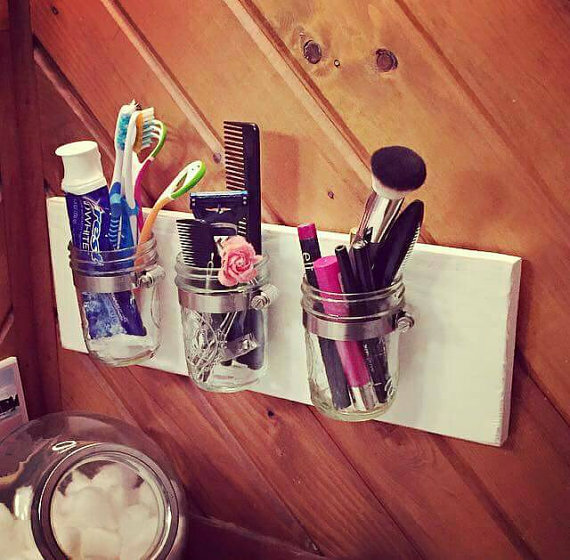 Especially in the bathroom, where everybody has a lot of smaller or bigger items that need to be stored and organized, a mason jar bathroom organizer is the perfect helper. Adding to its practicality, this mason jar organizer uses also inexpensive supplies and is easy to put together. Here is how to make it. If you want you can stain your piece of wood in order to achieve a color that will go well with the rest of your bathroom look. Let it dry completely before continuing the project. Attach the picture hangers on the back of the wooden piece. Use the measuring tape and pencil to align them correctly. 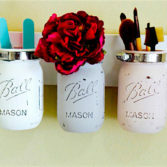 Use the measuring tape and pencil to mark the points of where you want to place your mason jars. It’s a good idea to lay the wood on a flat surface and arrange your mason jars on the wood, so you will get an idea on how you want the finished product to look like. Using a drill bit make a pilot hole into the wood, where you marked the spots. Also, using the drill bit drill a hole in the hose clamp at the point the clamp will be attached to the wood. Line the hole of the hose clamp and the hole in the wood up and using the screw bit and the drill secure the hose clamp to the wood. Repeat with the rest of the hose clamps you are going to use. Slide each mason jar through the clamps and secure them with by tightening the hose clamps by hand. Your bathroom organizer is ready to use. 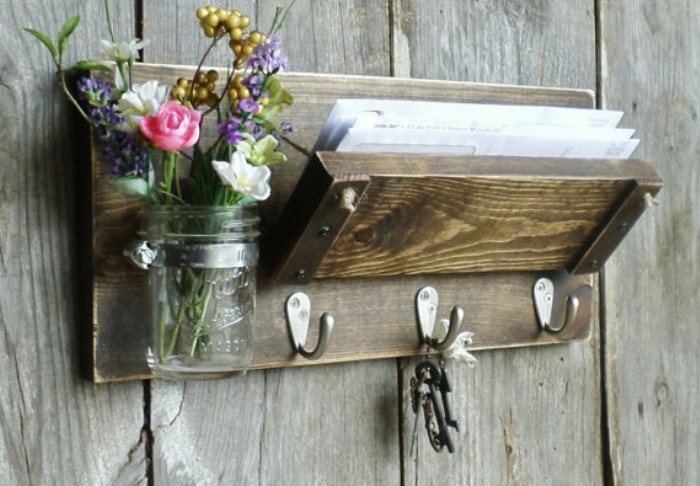 Just hang it up and fill the mason jars with your items. To clean a mason jar when needed, just unscrew the hose clamp while holding the mason jar so it doesn’t fall down and wash it as usual. 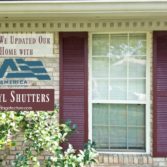 There is a huge variety for making fun DIY home projects out there. 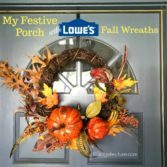 Some are easier than others but you can definitely find many that are worth the effort and that will improve your home, by either beatifying it or organizing it better. To organize a home, it needs to have storage solutions so every large or small item has its place and doesn’t become simple clutter. 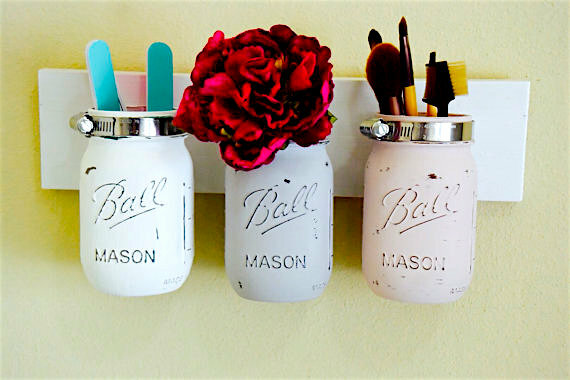 Mason jars are ideal to store and organize smaller items in every room; pencils and utensils in your home office, dry foods or kitchen utensils, decorative beads or flowers in the living room – the possibilities are endless. Mason jars are the perfect gift to give to anyone and especially to someone who loves to craft and appreciates unique DIY items. Make this Mason Jar Bathroom Organizer to use as a DIY room decor for every room in your house, for storing or displaying small items. 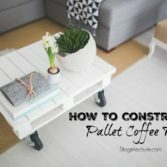 Think about using tinted or painted mason jars, arranging the mason jars in a geometrical manner or asymmetrical, using a different piece of wood in shape or color. This way you can create the absolute best item to use for any purpose in every single room. 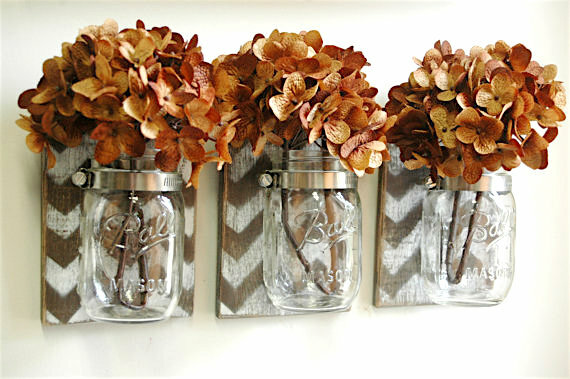 If you like these mason jar ideas take a look at our Best Mason Jar ideas on Stagetecture. I am in love with that mail/key organizer! Don't get me wrong, that bathroom organizer is super cool too, but seriously, I might be drooling a little over that mail organizer! Thanks so much for sharing at Merry Monday. I love DIY room decor to decorate my sweet home! I have made a plan to make some mason jar for my bathroom and was searching for a great idea. Your ideas are most helpful than others! These helped me to make my dream true. Thank you very much for the article!